Everyone loves to have some delicious splurges every now and then. Obviously the ones that are packed with sugar and the other bad things, tempt you the most. Horses are the same way. All those things that you eat, your horse want to eat too. Lots of people feed their horses human food of all sorts. From donuts to hamburgers, somewhere in the world you bet a horse has eaten it. But, what most don’t realize is that chemicals in big name brand foods and the products consumed in large quantities can hurt your horse. Pinky is a master treat begger. If this whole dressage thing doesn’t work out, she could be a treat tester. 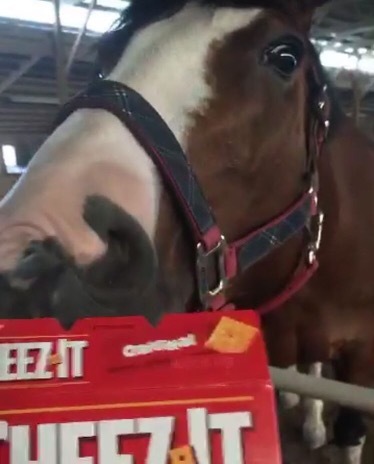 Her favorite snacks include The Pony Spot Shop treats, all foods of the fake cheese variety (X-tra Cheddar Goldfish and Cheez-Its), and Dairy Queen french fries. can you tell that she wants some? But, I have to be super careful with all of these foods. They could potentially be fatal for her when consumed is too large amounts. Most commonly, if feeding a human food, the serving size that is reccomended on the side or back of the box/bag is the maximum you should feed your horse. Some horses that have or had health issues such as colic should cut that serving size in half; especially if the snack is new to them. When feeding horse specific treats, 3-4 should really be your maximum if it is something like I have in the photo below. These treats are obviously very high in sugar content and that is exactly why they can be so bad. 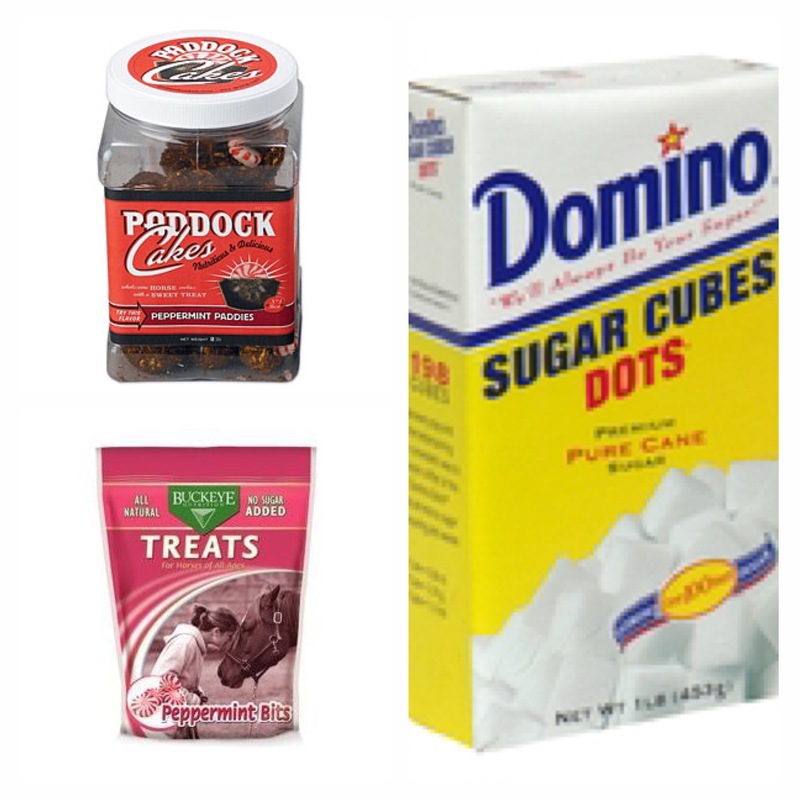 Treats of this variety can reek havoc on your horses stomach when fed in too large if portions or too often. There are tons if heather alternitives to these sugar packed treats. Pinky has some real “cushion for the pushin,” I am not going to lie. So in order to find a good treat that helped her stay is show shape and she loved took some work. I hunted for a few weeks to find some good brands that made what I was after. When I finally found a few that I liked, I bought small bags and then had her try them. The brands included those of Omega Nibblers Low Sugar/ Low Starch, Standlee AppleBerry Cookie Cubes(they aren’t actually cookies, just grass cubes), and DuMor Horse Treats. None of them seemed to be working for her or she just didn’t like them(much to my surprise). So in light of me not being able to find one, I took some initiave and looked up recipies of my own. After I found a good base and then added my own flare to them, I had Pinky try them. Instantly, they were a hit, but not just with Pinky. The whole barn was loving them! Thanks to my dad being a sucker to the cute pony eyes, the whole barn got to try my new concoction. Soon, I started to sell them through my store, The Pony Spot Shop. They were a hit in among the people in my barn and surrounding areas. In the first week there were over 15 orders. The treats are currently being improved but will come back out in November! You will find them in our etsy shop here and follow us on instagram @theponyspotshop. Hope this helps y’all with finding the perfect sweet treat for you four legged bestie!